Each painting by Ivan Ivanovich Shishkin is filled with love for his native land and nature, its infinite beauty and greatness. Careful drawing of all the details of the work of art is characteristic of this author. Due to this, the realism of his work is not questioned. The canvas depicts a landscape painted on a warm, warm day. 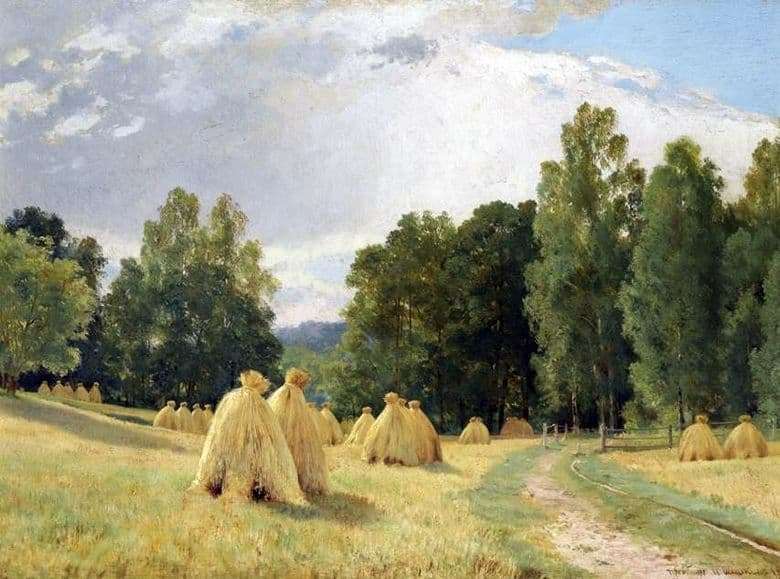 The most remarkable elements of the canvas are haystacks, neatly folded and placed next to each other. Light, almost yellow grass has barely noticeable orange and green blotches, the shadow of haystacks falls smoothly on the surface of the cut grass. The field in the right part of the picture cuts a barely noticeable path, framed by short growing grass. The path leads to the forest thicket, represented in the form of various trees. Closer to the trees you can see a small neat fence, built of wood beams. It becomes obvious that people working in the field do their work conscientiously and with a soul; their hearts are filled with love and devotion to their native land. The depth of the forest is given through the use of dark shades, concentrated in places of high density of planted trees. The tops of plants are consecrated by the rays of the sun. The sky above the field is clear, but filled with a large number of grayish clouds. The clouds shimmer with gray, blue and even orange. In the central part of the picture, you can discern light silhouettes of trees located far beyond the main elements of the exposition: their crowns are depicted almost blue, and a duet of this shade with a clear sky creates a stunning effect. The canvas evokes a feeling of admiration for the beauty of nature, its harmony, originality and grandeur.